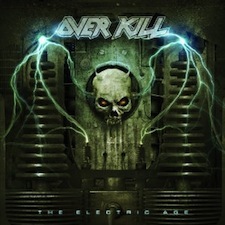 Overkill is back in full force with The Electric Age--their first album since 2010's critically acclaimed Ironbound. Right out of the gate, The Electric Age delivers the thrash metal intensity fans know to expect to get from the New Jersey band. The leading track "Come and Get It" opens with explosive riffs and thrash metal greatness. Right from the start, it is clear that Overkill remains true to their roots and their classic sound. Not only is "Come and Get It" a vastly appropriate title for an opening number, the song contains a blistering fast guitar solo and a cool Accept-esque chant that goes perfect with Bobby Blitz's vocal style. The next track "Electric Rattlesnake" has a much shorter intro and gets right into the rhythmic lyrics and aggressive vocals. The lyrics are heavy in their rhyming and are sung with major energy and primal intensity--especially the title. I'm also greatly amused by the content of the lyrics, because I'm pretty sure I heard the phrase "shake and bake." (Hey now, it DOES rhyme with "rattlesnake"!) I absolutely love the way the song slows down to this interesting groove--almost like it's a completely different song--then speeds back up to a more typical thrash metal pace. Both "Come and Get It" and "Electric Rattlesnake" appear to make use of different stereo channels to create a certain atmosphere that can be found on the rest of the record. It is very apparent when listening to the album on headphones, and it really creates a multidimensional sound. My absolute favourite track from The Electric Age is "Black Daze," which is near the middle of the album. The intro riff is reminiscent of something by Metallica's from the early days of thrash. The vocals, guitars, and rhythm section all mesh together so well on this song. The backing vocals are great and add a nice effect to the chorus, and D.D. Verni's bass line during the guitar solo is heavy--which makes this hard-hitting song even harder. Another standout track from is the driving and forceful "Drop the Hammer," which is also the longest track on the album. The vocals on this song kind of caught me off guard at first, because some parts are quite a bit lower than others--lower than Bobby Blitz's ear piercing scream. It must be said, and often--the man has versatile style and range! I particularly enjoy the way the title is sung in the chorus as "Drop the hammer dooooowwwwn!" The last half of the song, including the guitar solo, has an almost power metal feel to it, but the thrash returns in full force toward the end. One very unique song is "21st Century Man." It starts out with a driving hard bluesy rock beat, then it blends with a heavier thrashy sound just before the vocals hit. The poignant lyrics to "21st Century Man" tell of some of the trappings of 21st century life--technology (iPhones), trends (flash mobs), war, limited attention spans, and flat out disregard for others. One line that really sticks with me is "too much info here to stay." It really puts into perspective the sheer volume of information--much of it very personal--that people may carelessly post to the Internet. Overkill's The Electric Age contains one great metal song after another. The whole album has a very classic sound, while sounding and feeling brand new at the same time. It seems like this can be a rare feat for bands to accomplish nowadays. The vocals along with the instrumentation are strong and relentless, track after track. The lyrics are clever, relevant, and well-suited for the current landscape of metal. Thrash metal fans--especially metal fans looking for something new, exciting, and most importantly, solid--should pick up The Electric Age.